RAG status is often allocated to project tasks based on the intuition or “gut feel” of the project manager. But too much subjectivity in status reporting can lead to watermelon or green-side-up reporting, in which project status is reported more favourably than it probably should be. The more objective approach presented here introduces schedule automation to calculate RAG status in MS-Project ®, assigning a RAG rating to individual project tasks based on calculation. This approach can’t account for subjective things like project risks (that takes professional judgement), but it can give a useful “starter for ten” RAG status assessment onto which the PM can layer factors such as risk, or to act as the starting point of a discussion. You need to formulate the tests as a mathematical expression that when evaluated will return a TRUE or FALSE result. For example, to test whether an item should have finished by now, test for [Forecast finish date] < [Today’s date]. If the answer is TRUE, the item should have finished by now. These tests can be made as simple or complex as you like, for example you could enhance the Red test so that Red returns true if the item (is forecast to finish earlier than today’s date) OR (is on the Critical path, and is forecast to finish later than baselined) OR (is on the critical path and has not yet been baselined). After testing for item completion (because if the item is complete then none of the other tests apply) these tests will be applied in order of decreasing severity (because an item that triggers a Red condition would probably trigger all the Amber conditions too). 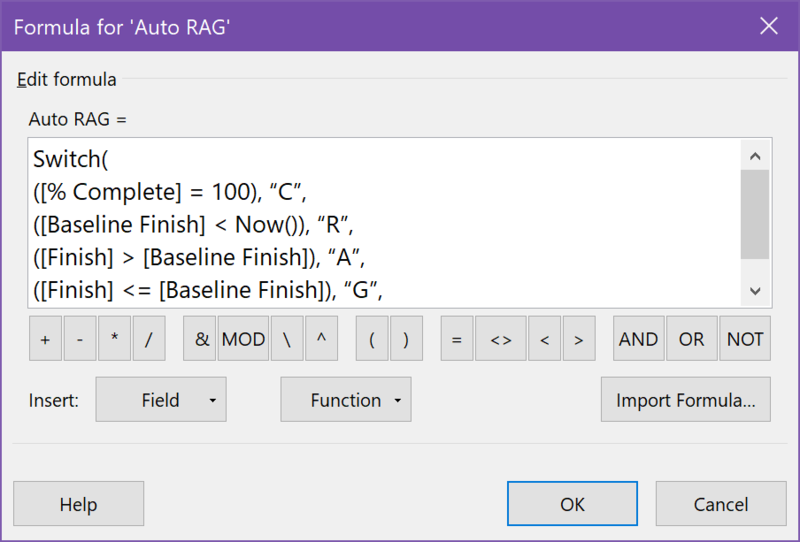 To calculate RAG status in MS-Project ®, first pick an empty custom task text field (in MS-Project 2016, select Project, Custom Fields), rename it something like “Auto RAG” and click on Formula (see figure 1). The TestThatAlwaysReturnsTrue at the end “catches” the condition where none of the previous tests return a True result. Seeing the “ERROR!” result should prompt you to check your tests (or add some more conditions to catch other scenarios). I have formatted this to make it more readable. Be aware that MS-Project will strip out the spaces and returns, so the formula will look a lot less readable if you ever have to come back to edit it. Put this in the “formula box” (see figure 2). The approach is to test whether the value in the field “equals” each of the RAG status values and to assign an appropriate graphical symbol to each. Congratulations! You have now introduced schedule to calculate RAG status in MS-Project ®, so you can tell you what the RAG status of an item should be, based on a rigid interpretation of whatever rules you have given it, ready to have overlaid upon it any other factors the PM knows about. What approaches do you use to calculate RAG status in MS-Project? This approach comes to you from my experience of getting it wrong and coming up with a better way. If you would like to have the benefits of an approach like this but prefer not to have to worry about this sort of techy stuff, why not talk to us about taking care of it all for you on your next big project or programme? Interesting read Ken. It’s something I’ve used to try and engage policy people in planning. Great success when I changed the RAG ratings to smiley (G) and grumpy (R) faces. No-one wanted a grumpy face! Hi Lorna, thanks for reading the article and taking the time to comment. I’m glad it struck a chord with you. I have also used faces to indicate RAG status, mainly to overcome potential issues with red/green colour blindness (more common than you’d think) and monochrome printing / photocopying (prohibitively expensive a few years ago, less of a problem nowadays). Things like emoticon faces get a somewhat mixed reaction in corporate circles (e.g. financial services). I think it’s a friendly and visual (especially if the faces are also coloured Red 🙁 / Amber 😐 / Green 🙂 ) way to give a quick indication of how things are going. And you’re right: no-one wants to get a grumpy face!